Hage Geingob has declared a “war on poverty” but has yet to turn his fine words into action. 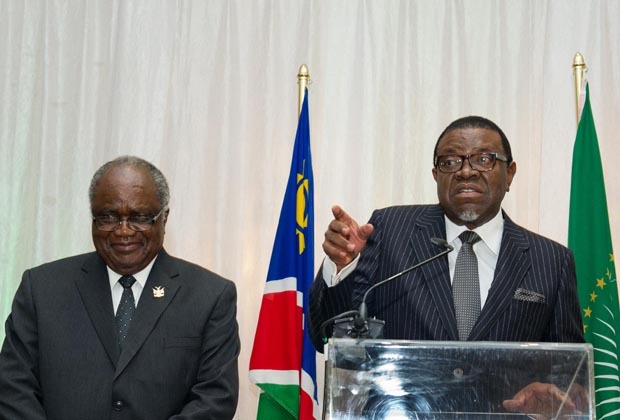 President Hage Geingob (right) has been in power for one year since taking over from his predecessor Hifikepunye Pohamba (left). Credit: DoC. As Namibians take stock of President Hage Geingob’s first year in office, they have much to ponder. This has been one of the most active years in Namibia’s one-party dominated politics for a long time. For ten years under former president Hifikepunye Pohamba, Namibians had become used to good-natured but listless leadership (ultimately rewarded with a Mo Ibrahim Prize for African Leadership at the end of his second term in 2015). But since coming to office on 21 March 2015, the 74-year-old Geingob has sought to shake off the inertia of the Pohamba era by declaring a “war on poverty” and adopting the slogan “no Namibian will be left behind”. This rhetoric has resonated with a Namibian populace struggling with an unemployment rate of 28% and one of the highest levels of inequality in the world. Expectations of more jobs, comprehensive welfare programmes and improved service delivery are high under Geingob. Geingob has the kind of mandate that would be the envy of most political parties around the world. In national elections in November 2014, he won 87% of the vote, ahead of his own party, Swapo, which took a commanding 80%. Normally such results in Africa raise eyebrows if not claims of outright rigging. But these results were accepted by opposition parties and adjudged free and fair by local and foreign observers. Geingob benefited from the fact that he is one of Namibia’s best-known political figures, having been the country’s first Prime Minister from 1990 to 2002, though the result was still remarkable, and all the more so given he is from a minority ethnic group, the Damara. However, despite overwhelming public support and a small-time and fragmented opposition, Geingob has struggled to turn rhetoric into action since the election. The new president’s intentions were clear when he established a Poverty Eradication Ministry, and he has gone on to say he wants poverty wiped from the face of Namibia by 2025, which would be the end of his expected second term. But the Ministry has done very little in its first year apart from organise talk shops. A much-vaunted plan to introduce food banks for the poorest has yet to materialise. And while the introduction of a Basic Income Grant (BIG) has been the subject of discussions about welfare reform for years and is officially on Geingob’s agenda, its format is far from clear. The president seems to want a limited, means-tested grant while his anti-poverty minister, Bishop Zephania Kameeta, talks airily of a universal system. Either way, it looks like an unfeasible idea in the short-term as Namibia’s finances are stretched as never before. As Geingob uttered fine rhetoric and promises during 2015, more problems seemed to crop up. After several years of high government spending in an attempt to mitigate the worst effects of the global economic downturn, debt and deficit levels have been pushed to the point where a credit ratings downgrade has become a possibility. As a result, Geingob’s administration has had little fiscal space to introduce the kind of pro-poor changes he wants to see. Towards the end of the year, a ham-fisted attempt at introducing a so-called Solidarity Tax to fund anti-poverty schemes was met with howls of protest from Namibia’s emerging middle class, already tired of funding a bloated civil service of over 100,000 employees. The tax is temporarily off the table and is likely to be reintroduced in 2017 as a wealth tax on top earners only. Elsewhere, Minister of Finance Calle Schlettwein cut back on travel, expense allowances and luxury vehicles for civil servants, but these efforts were undermined by Geingob’s predilection for appointing an array of special advisors, adding to an unsustainable ‘superstructure’ executive that already has 60 ministers and deputy ministers. Meanwhile, although government has generally tried to rein in spending as revenues from the Southern African Customs Union drop, the Geingob administration has stuck to controversial projects such as the building of a new parliament building for over N$2 billion ($132 million). During 2015, drought conditions worsened across the country and the capital city, Windhoek, is forecast to run dry in late 2016. As a major water crisis looms, the government’s efforts to boost power generation from within the country has stalled. Development of the offshore Kudu gas field was deemed too expensive for now, while plans to build a gas-fired power station at Walvis Bay have become mired in allegations of corruption. Geingob has been indecisive on both the water crisis and the electricity shortfall, and the private sector and prospective investors are starting to get worried. Adding to perceptions that the Geingob administration has little sympathy for the private sector is the country’s black economic empowerment law which was unveiled in draft form in February. Although the intention of the proposed law, called the National Equitable Economic Empowerment bill, to address imbalances caused by Namibia’s apartheid past has been welcomed, it is feared that it will ultimately deter both domestic and foreign investment and therefore undermine job creation. Demands that all new business have a minimum 25% shareholding held by the previously disadvantaged and regulations that mean black-owned businesses cannot bring in white investors have spooked the business community across the board. Where Geingob has been more successful is in trying to re-orientate the government towards targeted outcomes. He has managed to get all ministers to sign performance agreements setting out annual goals. Meanwhile, he has also gained international kudos for becoming the first African president to voluntarily declare his assets. According to his declaration made in April 2015, Geingob is worth N$50 million ($3.3 million) while his wife Monica has assets ranging from N$45-60 million ($2.9-3.9 million) having been a successful businesswoman before she became First Lady. This move towards transparency, however, wasn’t backed up by any concerted efforts to ensure all other top political bearers declared their assets too. Geingob also introduced a more open policy towards the media, hosting regular press conferences at which he answers journalists’ questions. At times, this has backfired as reporters from Namibia’s lively newspaper scene have peppered him with queries about his own salary level, government profligacy, and the cost and necessity of his foreign trips. In the face of such criticism, Geingob tends to become prickly, even claiming that he does not know how much he earns or how much his special advisors are paid. This tendency towards defensiveness was particularly evident when he was interviewed on the BBC’s Hardtalk programme at the end of 2015, a poor showing on a platform where he could have marketed Namibia’s many selling points. In 2017, Swapo is due to hold its quinquennial congress, ostensibly to elect a new party leadership. Geingob should be confirmed as party president, but there may be a battle royal for the other important positions as who emerges on top could well indicate which faction will control the party after Geingob. Any shift away from Geingob supporters’ dominance in the top four party posts and the party’s central committee could undermine his effectiveness as a second-term president. Most opposition parties are little more than moribund. Only the official opposition, the DTA of Namibia, has been able to make slight dents in Swapo’s monolithic and extremely loyal support base. However, outside parliament, Geingob has faced a challenge from the Affirmative Repositioning (AR) movement, some of whose leaders were previously in the Swapo Youth League. AR has challenged the government on the lack of urban land and housing for young people. Threats of nationwide protests last July brought both sides to the negotiating table. A typically Namibian compromise was hammered out. Although the details of the deal are hazy, government has started clearing land and building houses at an accelerated pace. The fact that violent confrontation over the issue was avoided indicated yet again that most Namibians value the country’s peace and stability – even if it has not brought much in the way of economic growth and jobs. As he approaches the anniversary of his inauguration on 21 March, Geingob is talking up an ambitious new national strategy – the Harambee Prosperity Plan – which aims to elevate and accelerate policies that will significantly raise the living standards of poorer Namibians. The plan is a tacit admission that Namibia’s five-year development plans have not worked and that a new approach, to be driven by an energised presidency rather than the sleepy National Planning Commission, is needed. Geingob has acknowledged that after all the speeches of 2015, his second year in power will have to be about implementation. Indeed, the feelings of goodwill towards a clearly well-intentioned president may start to evaporate if progress does not become evident in 2016. Graham Hopwood is the Executive Director of the Institute for Public Policy Research based in Windhoek, Namibia.